Backpackers on a long trip in a remote location often rely on their knowledge of the clouds and wind to know what the weather will be like in a few hours or the next day, but this method is not too reliable and cannot be used to make predictions several days into the future. The best forecasts take into account the weather events that are happening over a broad region. Knowing where storms are now can help forecasters predict where storms will be tomorrow and the next day. Technology, such as weather satellites and Doppler radar, helps the process of looking over a large area, as does the network of weather observations. The chaotic nature of the atmosphere means that it will probably always be impossible to predict the weather more than two weeks ahead; however, new technologies combined with more traditional methods are allowing forecasters to develop better and more complete forecasts. Read on to learn more about some of these tools! Unlike ordinary radar, which is able to report the location and strength of precipitation, Doppler radar is additionally able to indicate the wind direction, wind speed and boundaries between warm fronts and cold fronts. 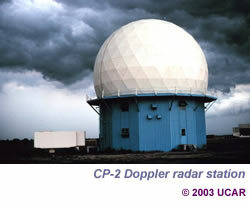 This is why Doppler radar has become such an indispensable tool for weather forecasters. Satellites, dropsondes, weather stations, weather buoys, ships, and airplanes are all sources of weather data. Weather stations and buoys record various weather parameters at fixed locations. Ships and airplanes act like moving weather stations, recording weather data at their current position. Also, each day 1800 dropsondes collect weather information as they drop through the sky after being launched from balloons or released from airplanes. Satellites, with their unique perspective on the weather, are important sources of weather data as well. The data from all of these sources are channeled into a supercomputer at a central location to make weather predictions that take into account the current weather. Numerical forecasting, or using mathematical calculations to predict the weather, is not a job for the average calculator, or even your average desktop computer! Supercomputers, which are capable of doing more than 2 billion operations a second, are fed weather information from satellites, weather stations, and other sources. To generate weather predictions, they perform many calculations that take into account broad-scale factors such as air pressure differences, solar radiation, the Earth’s rotation, and the water cycle, as well as the current information. This allows forecasters to generate more accurate forecasts based on a comprehensive regional perspective about the current weather, instead of just observations at a single point. Thus, backpackers who sets out into the wilderness knowing a weather forecast generated using computers and regional data will have a good idea of the weather that they may encounter.